Islamabad, September 3, 2018: “Climate Change has clearly become Pakistan’s most pressing challenge in its scale and impacts. This platform is particularly important, since Pakistan is ranked 7th in the list of countries most affected by climate change, which is potentially catastrophic. Given its place in the region and its growing population, it is crucial for Pakistan to be able to monitor, prevent and respond to climate change,” said Senator Sherry Rehman, convening the inaugural session of the Climate Change Caucus of the Senate. “In my opinion, climate change is one of the most threatening challenges in the 21st century. Climate change has now become an issue for survival and it’s high time we wake up. It is alarming that very little has been done to understand and tackle this issue. In the absence of robust policy, climate change has caused t a multiplier of threats and depletion of the country’s already strained resources. A comprehensive plan to address climate change should have been in place yesterday. Despite that, I am glad that this caucus is starting to take shape and will hopefully lead the narrative, push for stronger advocacy and government accountability regarding the reality of climate change not just in Pakistan but in the region as well,” Rehman further stated. The Climate Change Caucus, in its inaugural meeting, decided to build a liaison with the provincial Climate Change Committees and forums for better coordination in terms of legislation and implementation in the area of climate change. 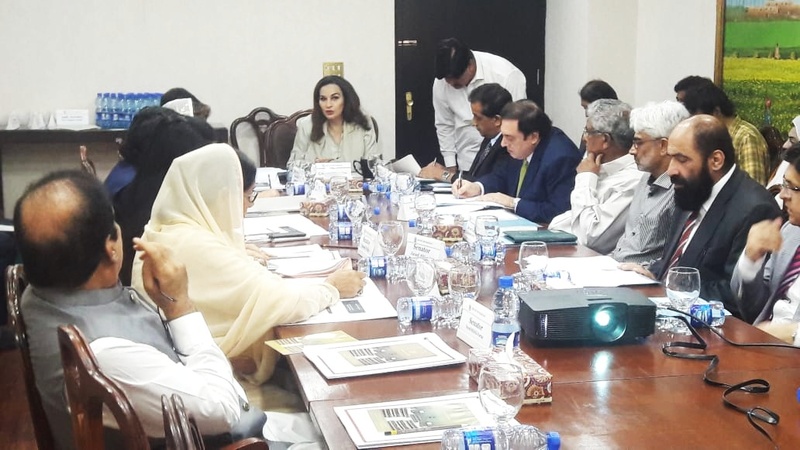 The caucus meeting was held with Senator Sherry Rehman as the chair and was attended among others by the Leader of the House in Senate, Syed Shibli Faraz, Senators Nuzhat Sadiq, Javed Abbasi, Muhammad Akram, Sitara Ayaz, Usman Kakar, Faisal Javed, Khushbakht Shujaat, Jahanzeb Jamaldini, Sassui Palijo, Advisor on Climate Change Malik Amin Aslam, Secretary Climate Change and other officials from the ministry. Members deliberated upon the terms of reference for the working of the caucus. It was decided that it will work to create climate literacy among Parliamentarians, civil society, and other influential spheres in order for a collective effort to emerge in countering climate change. The members discussed the fact that Pakistan has been a victim of climatic injustice for far too long and we should be active participants in the global discussion working to counter climatic change conditions. At the same time, it was agreed that the caucus is not to assume the role of provincial governments or replicate the work of the standing committee, and that its actual role will be of climate advocacy. The caucus was briefed by the Ministry regarding its budget heads, international conventions relating to climate of which Pakistan is a signatory, the role and purpose of climate change authority and replicating the KP billion tree tsunami project among other matters. The caucus meeting also discussed the parameters to be considered while designing plantation drives and the importance of making climate change guidelines province-specific as different areas are faced with different issues as a result of climate change. The caucus members decided that provincial representatives of climate and environment departments will be invited to the meetings in future to identify the gaps in policy decisions and their implementation.